JurassiFruit™ is an all natural scented appetite stimulator. Our research has shown that many reptiles, primarily herbivores, are attracted to natural fruit scents/odors, such as strawberry. 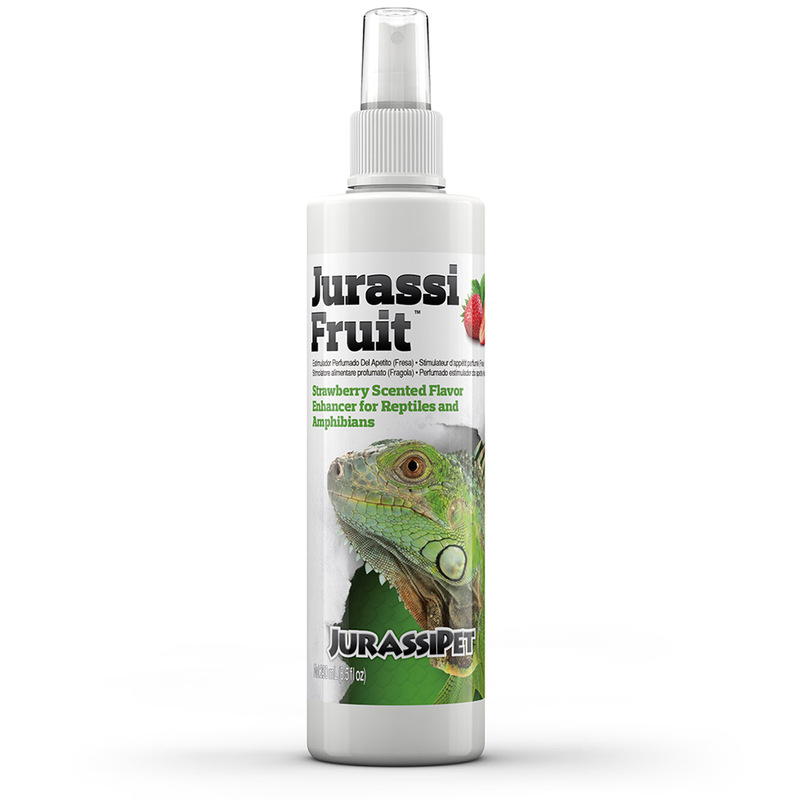 Simply spray JurassiFruit™ onto any food item to elicit a feeding response. Ideal for all reptiles, especially herbivores (tortoises & iguanas). Available in strawberry and banana scents. To renew the interest of finicky carnivores, try our garlic-based JurassiGuard™. 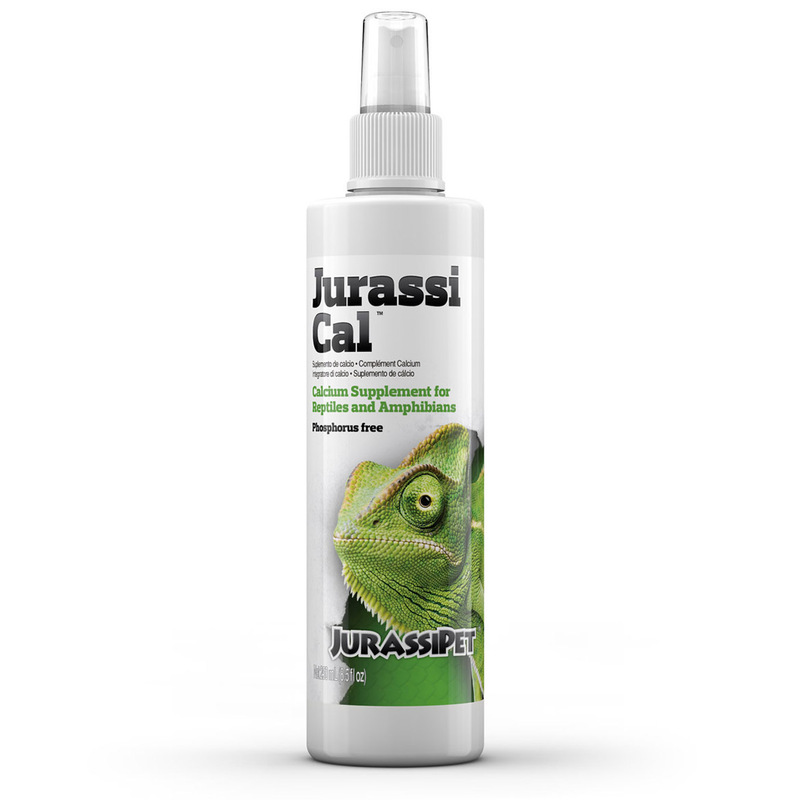 JurassiFruit™ can be particularly helpful in getting hatchling tortioses and bearded dragons onto more comprehensive pelleted diets such as the JurassiDiet™ range of pelleted foods, which contain a broad spectrum of all the important components needed in a reptile diet: protein, fat, carbohydrates, vitamins, and minerals. JurassiDiet™ also contains probiotics, which reduce waste and benefit nutrient uptake as well as the immune system. While strawberries and bananas may be a delicious treat for your animal, they don't necessarily have a lot to offer in terms of nutritional value. Strawberries have a Ca : P ratio of 0.8 : 1 and bananas have a ratio of 0.3 : 1. Too much of either could easily throw off the proper 2 : 1 Ca : P ratio in your animal's diet. 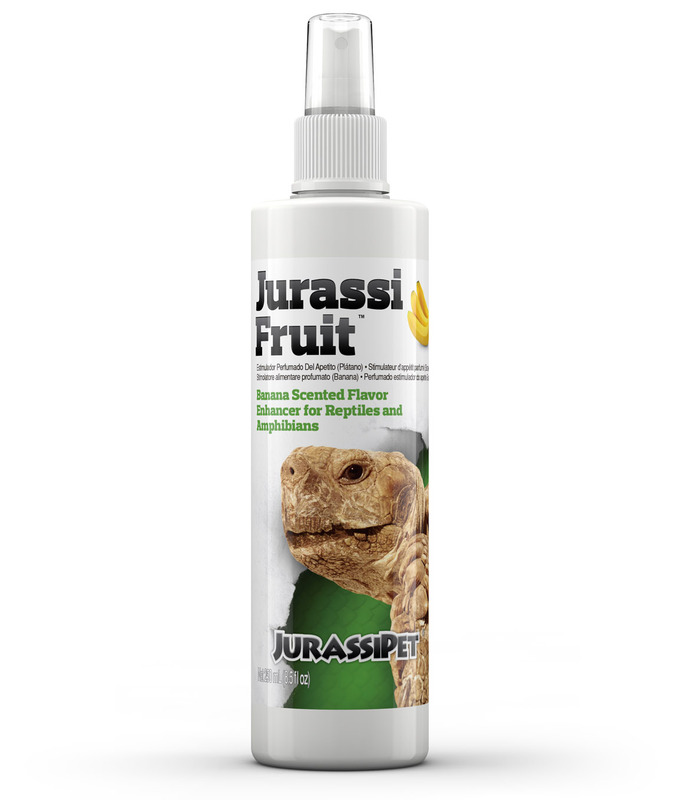 Because JurassiFruit™ has only the scent and flavor of strawberries and bananas, spraying JurassiFruit™ on highly nutritious foods is a good way to give your animal a treat while not adversely impacting their diet. Conversely, you could try dusting strawberries with JurassiCal™. Spray food before feeding. When spraying pelleted diets, let food soak for 3 minutes and then feed. There is no danger of overdosing so use as liberally or sparingly as you ﬁnd best suits your animal.